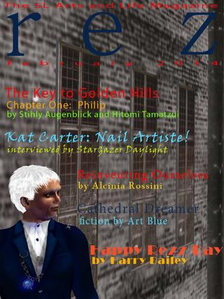 The February issue of rez features the cover story, The Cathedral Dreamer, by Art Blue, a fictional account of the creation of a new world, Genesis. rez is pleased to introduce the team of Stihly Augenblick and Hitomi Tamatzui, who bring us the first episode of a six-part noir thriller, The Key to Golden Hills: Philip. Gudrun Gausman explains the history of Valentine's Day in her enlightening article, Happy Lupercalia, My Love. StarGazer Daylight interviews SL nail artist, Kat Carter, in an illuminating feature, Kat Carter: Nail Artiste! Newcomer Alcinia Rossini shares her insights into communication in the virtual world in her article, Reinventing Ourselves. The Perfect Gentleman, Harry Bailey, waxes nostalgic about rezz days and staying forever young at heart in his Happy Rezz Day! Crap Mariner, in his microfiction piece, Harpoon, shows us just how hard it is to outwit the TSA.